Yesterday (2019.02.05) I asked Would you be interested in dPoll exclusive Steem Monsters card(s) giveaways?, and 7 of 10 (70% of the) people voted for "Yes, I would be interested in dPoll exclusive Steem Monsters card(s) giveaways. ", so I decided to "bring it on". 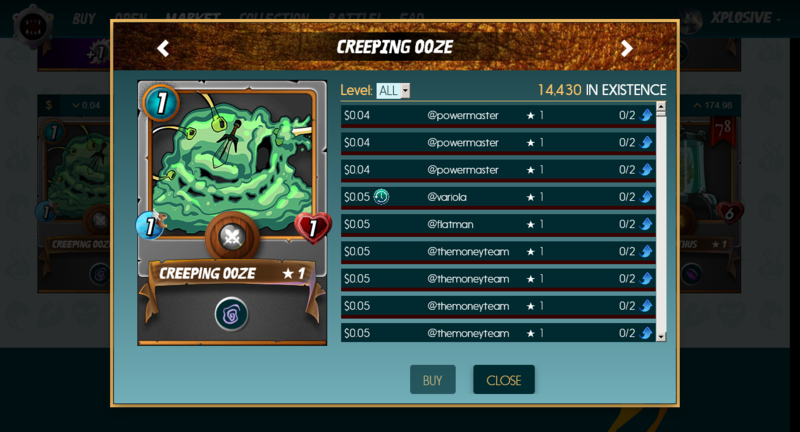 The Steem Monsters card in my first Steem Monsters card giveaway is the "Creeping Ooze". Image source: Screenshot. Screenshot was taken on 2019.02.06, 08:08 CET. As you can see in the screenshot above, currently there are 14 430 cards in existence of this card, and the current cheapest price of this card on the Steem Monsters Market is $0.04 USD. This card is cost only 1 mana during a battle. This card can't attack, but it has the "Slow" ability, which means that it will slow down the speed of the enemy monsters. You can use it to your advantage (or to your disadvantage, if you choose it and use it during a "Reverse Speed" battle, because in a "Reverse Speed" battle, monsters with the lowest speed attack first and have the highest chance of evading attacks. However, the "Creeping Ooze" can be easily killed in normal circumstances, because the "Creeping Ooze" have only 1 health by default. No upvote, no resteem required to participate in the giveaway, but it would greatly help the giveaway. I appreciate and I am greatful for every help. You only need to vote on the appropriate/proper answer on dPoll to participate in this giveaway, because this giveaway is a dPoll exclusive giveaway. If you are new to dPoll, and you don't know, then I tell you the fact that dPoll is a poll dApp (decentralized application) on the Steem blockchain, and voting on a poll on dPoll results in a comment, stating "I voted for xy" (plus optional additional thoughts). I will use a random name picker (https://www.miniwebtool.com/random-name-picker/) to choose the winner(s). Every poll on dPoll have an expiration date. Nowadays the poll creators can choose "1 month" or "1 week". I usually choose "1 month", but now I choosed "1 week". I will choose the winner(s) after 1 week counted from the posting of this poll. How many winners will be in this giveaway? I currently have 6 "Creeping Ooze" cards. Depending on the number of the voters on this poll, I will choose 1 winner, if the number of the voters is below (less than) 10. I will choose 2 winners, if the number of the voters is above (more than) 10. Good luck to every participant in the giveaway! Thank you for participating! I would like to win a "Creeping Ooze" Steem Monsters card. I am not interested in this card. I am not interested in this card, and I am not interested in Steem Monsters either.